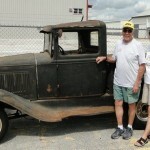 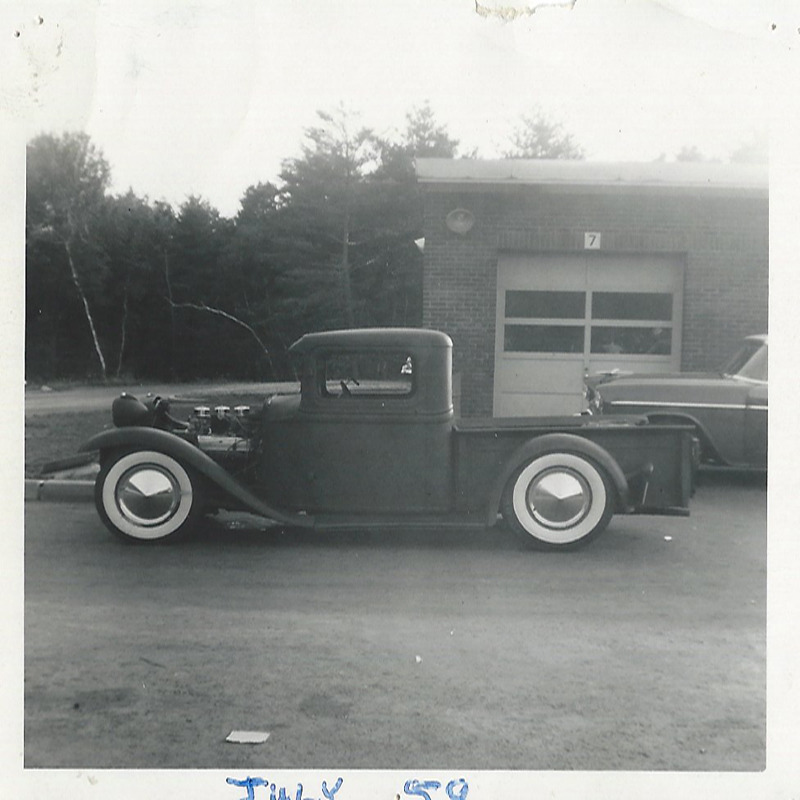 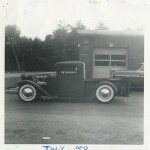 In 1958 or so Dad found, while in the United States Air Force in New Hampshire, a 1932 Ford pickup that he just had to have. 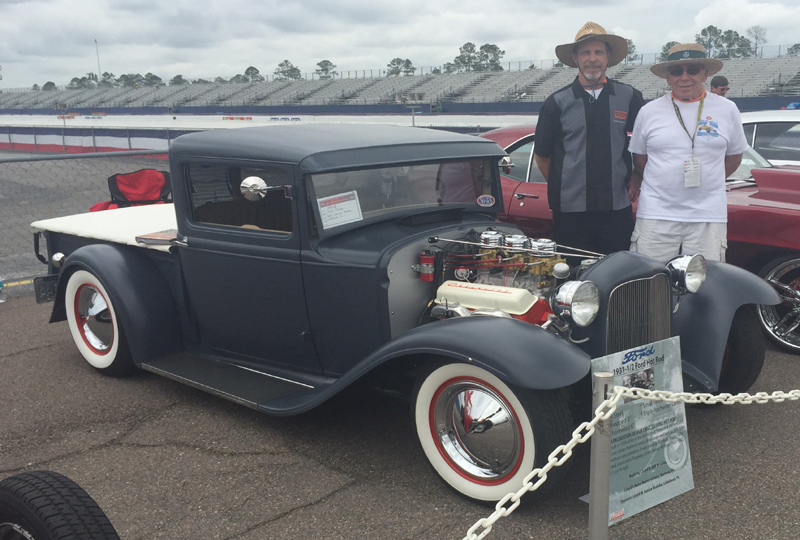 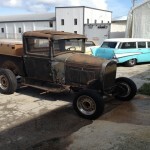 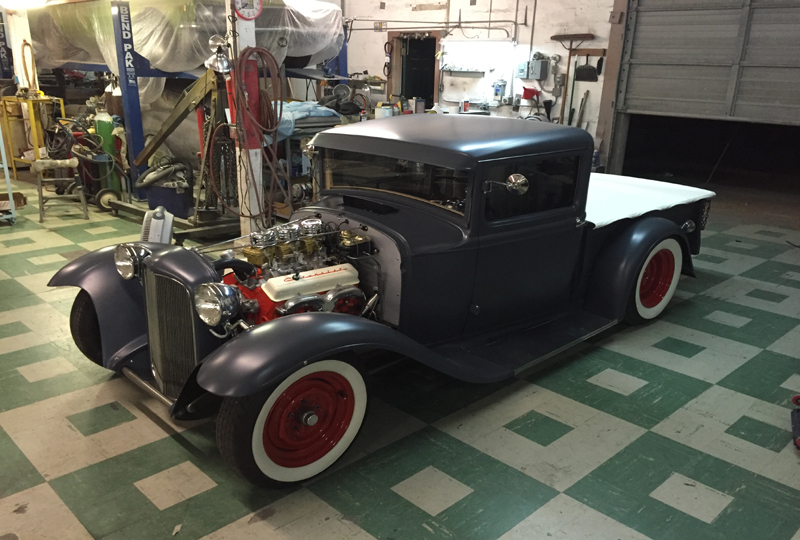 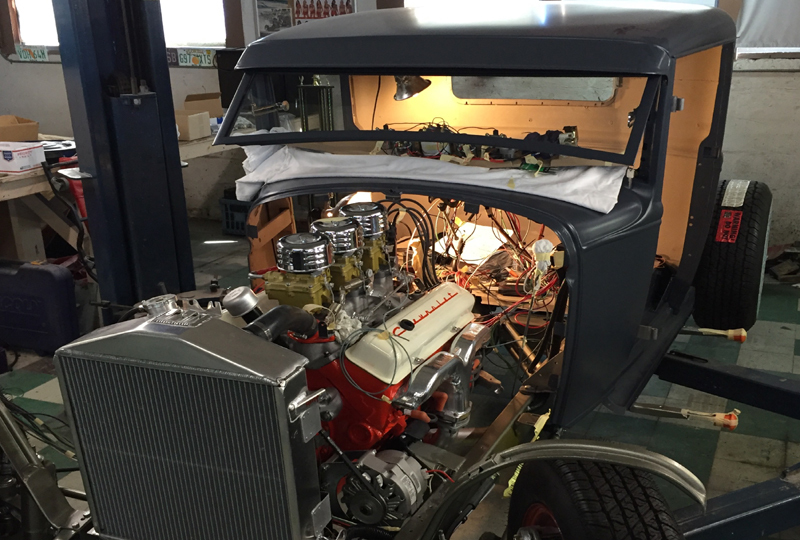 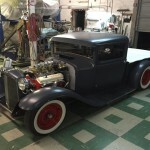 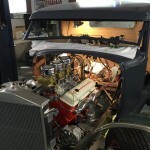 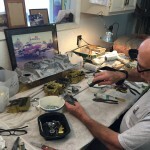 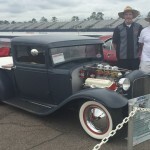 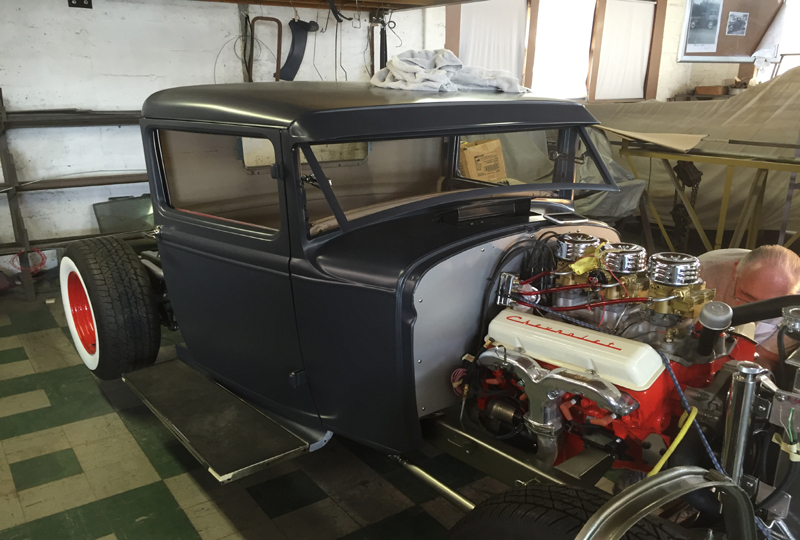 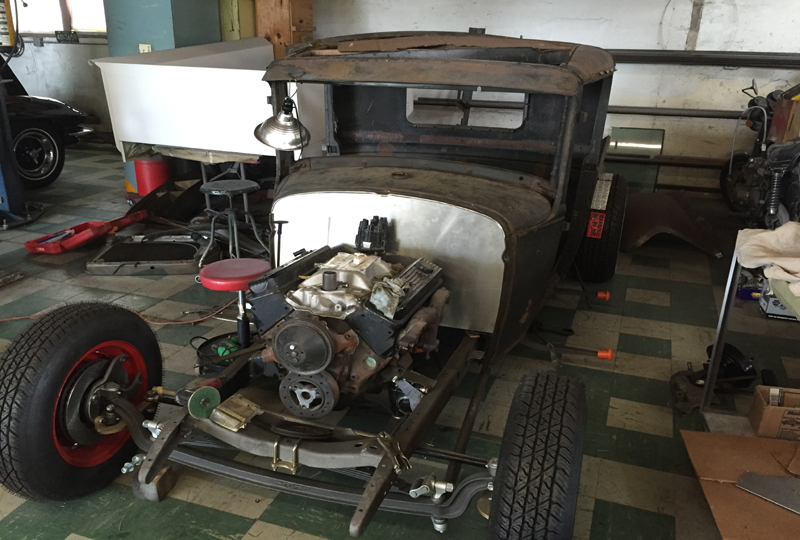 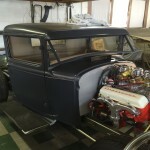 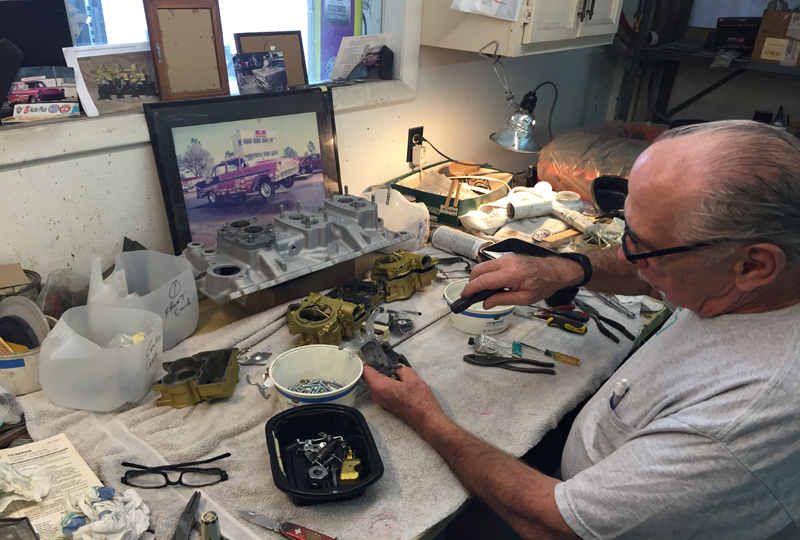 He made the purchase and immediately swapped all the drive train components from his current ride a1940 Ford 2 Dr sedan into the truck. 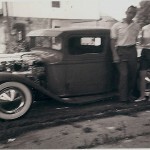 The above photo is some time near 1959 when Dad came home to Johnson Creek, Wisconsin, on leave. 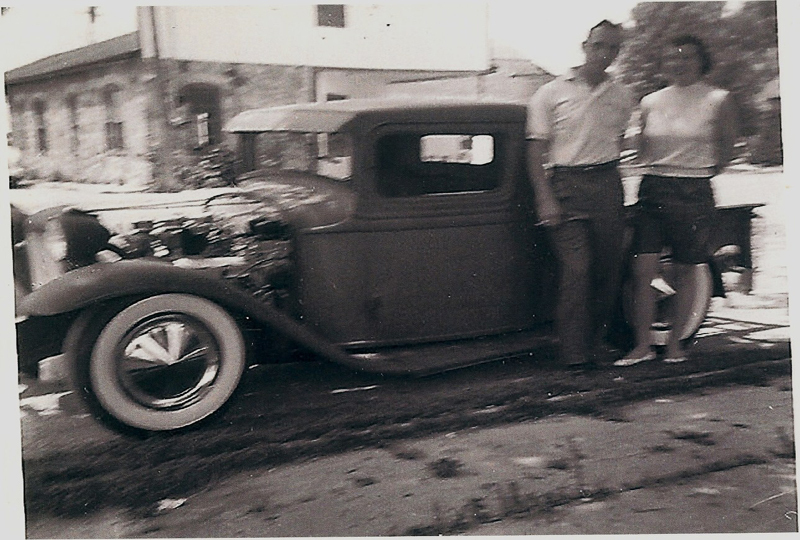 With him is his girl friend (not yet married) my mom. 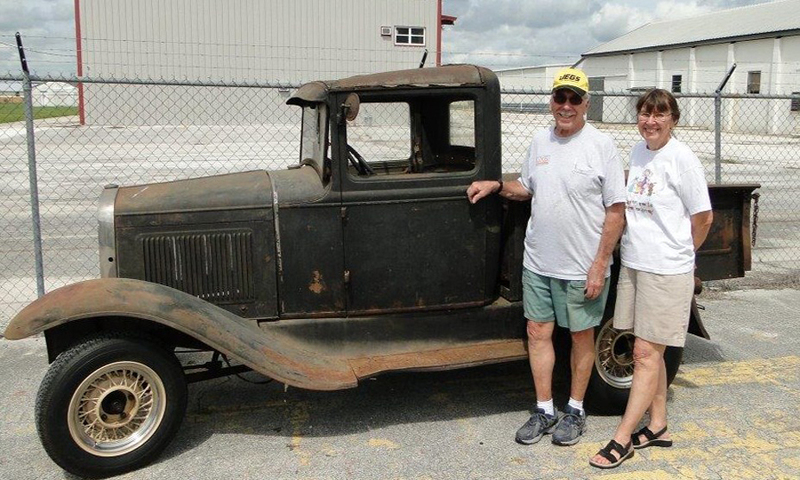 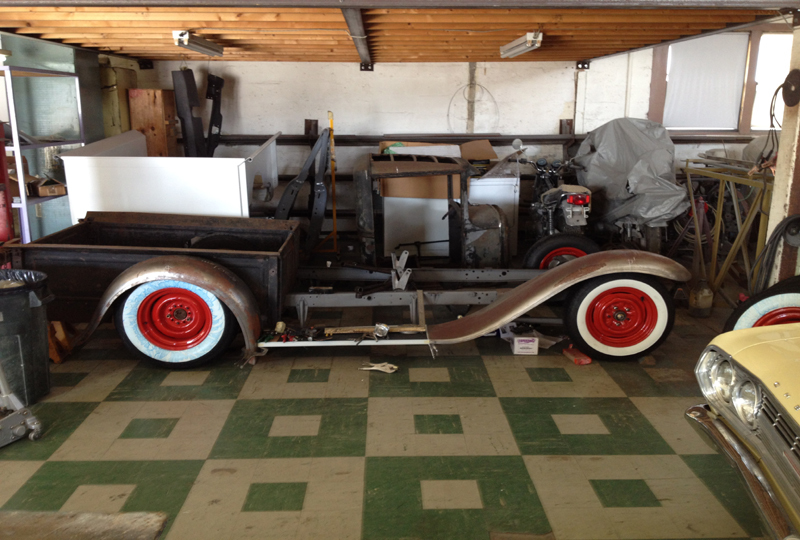 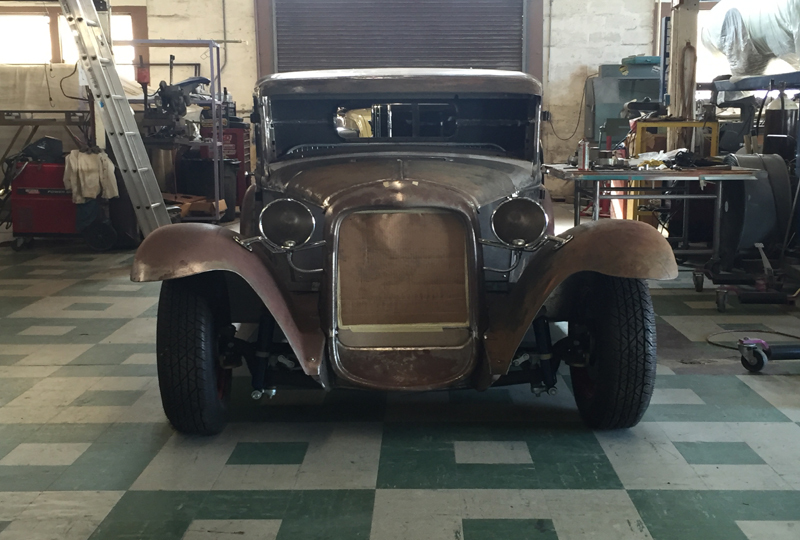 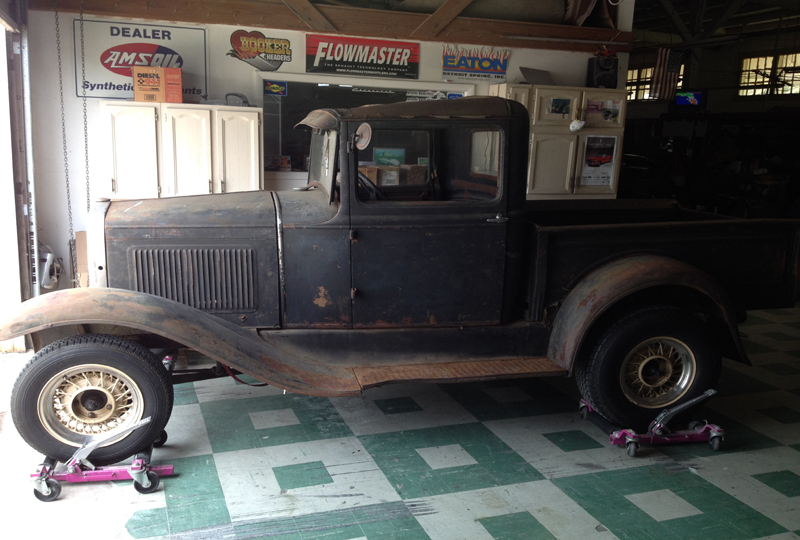 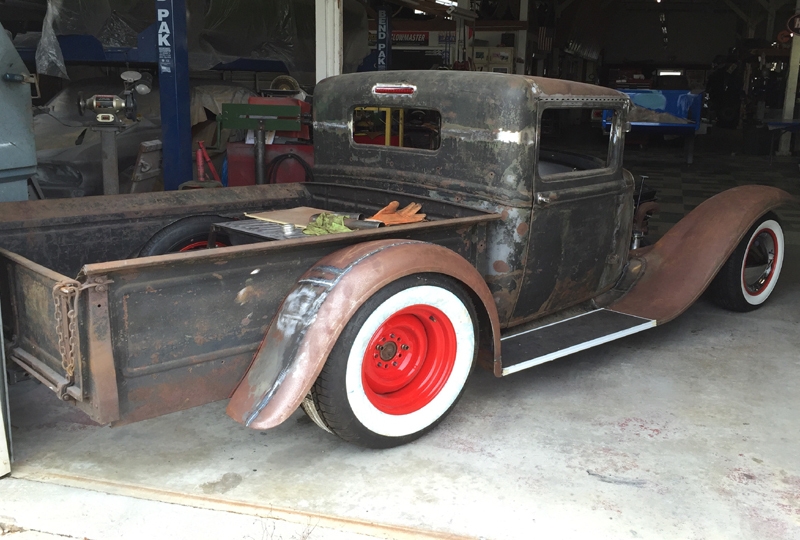 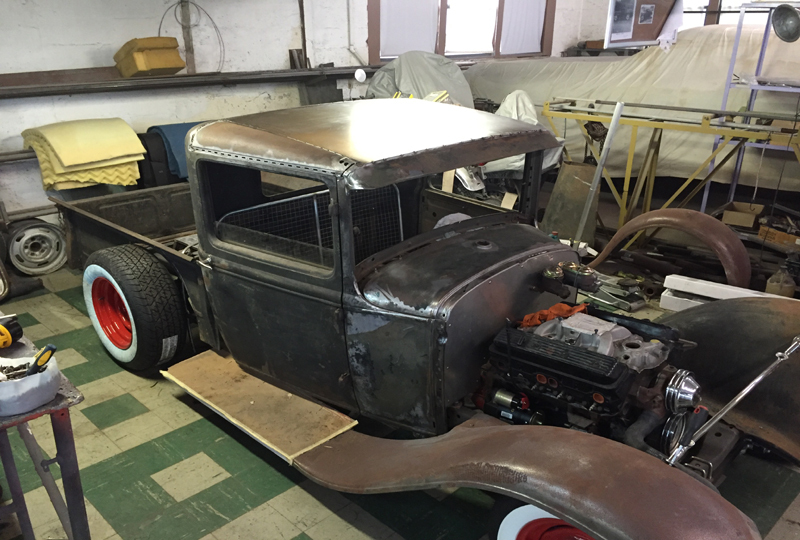 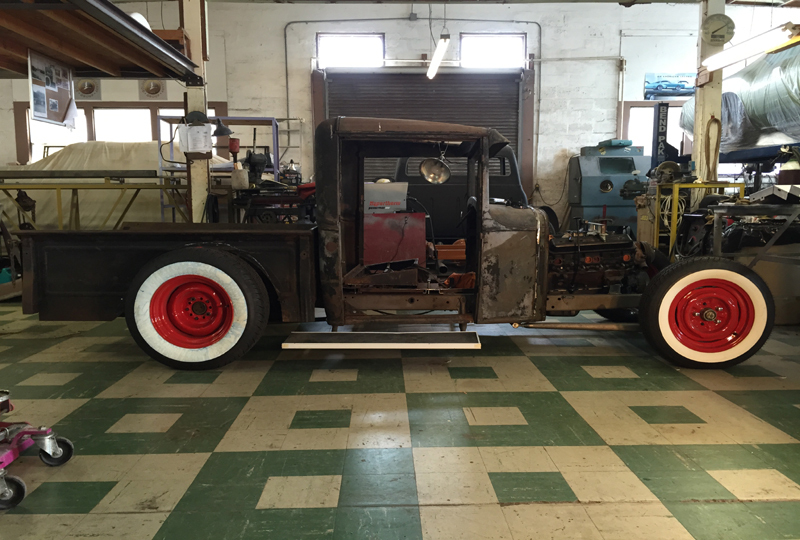 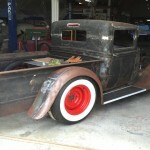 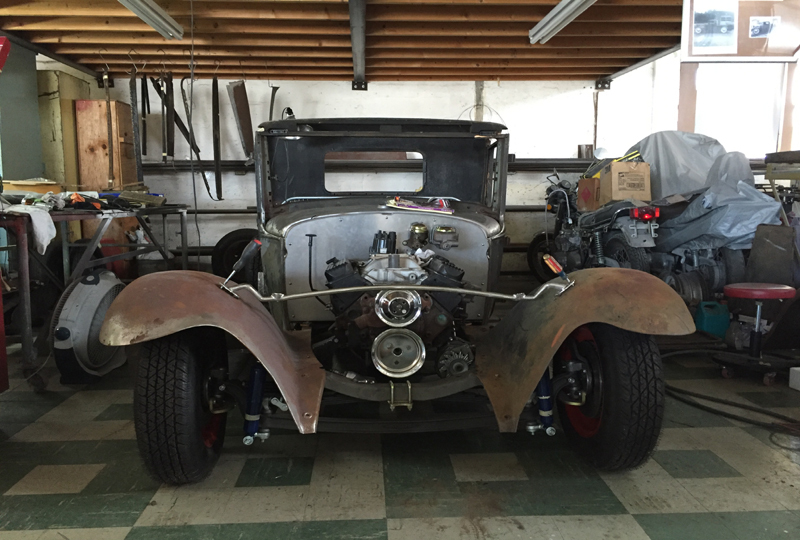 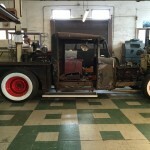 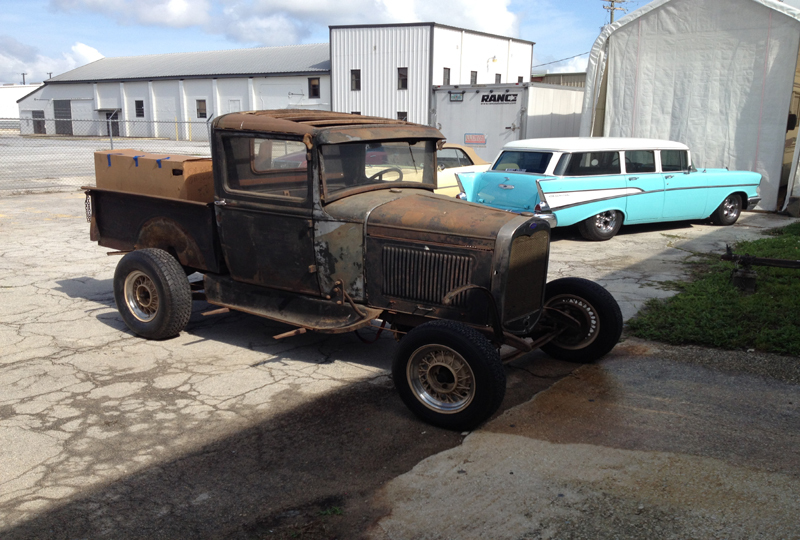 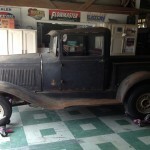 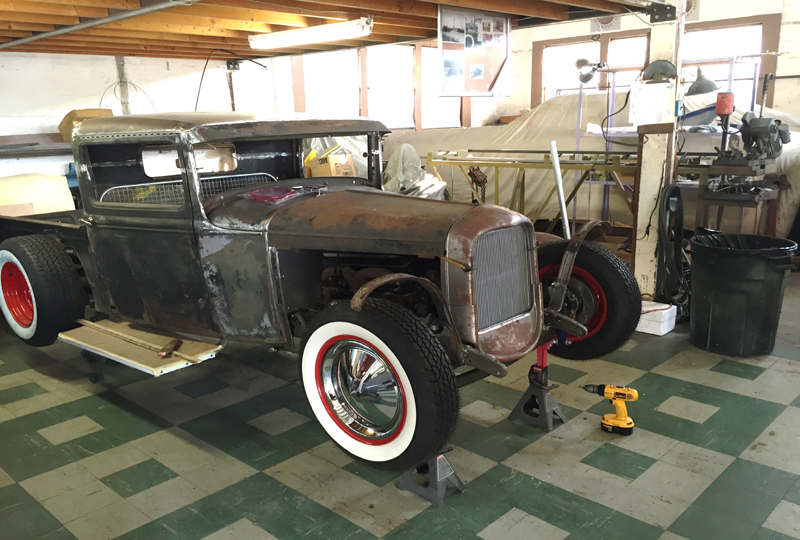 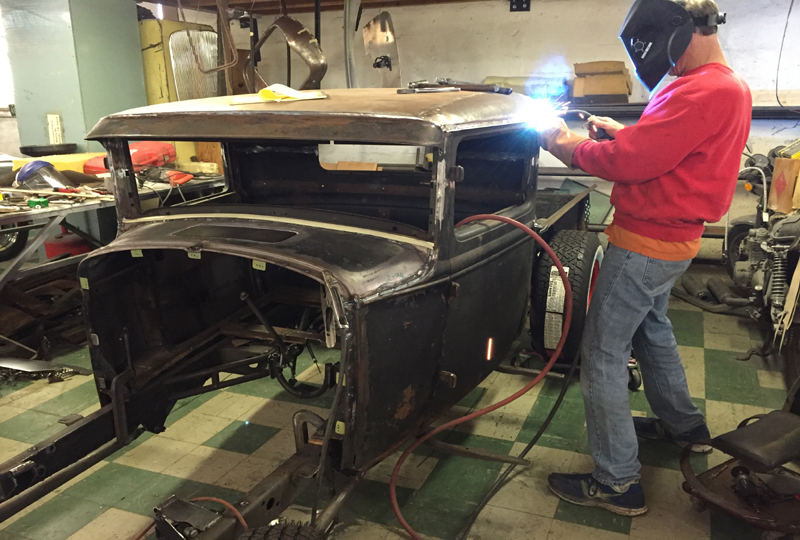 Now in 2015 another truck was found, a 1931, that will become converted similarly to what he had back then. 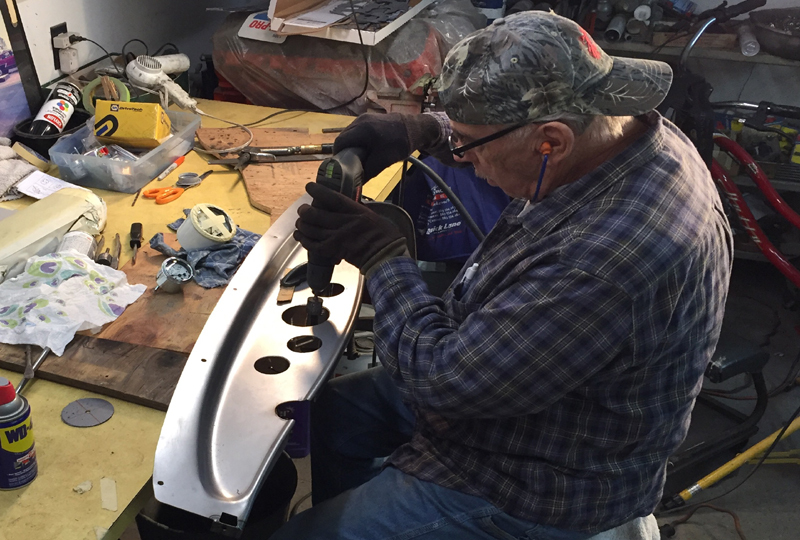 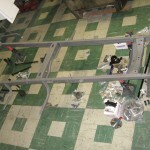 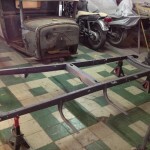 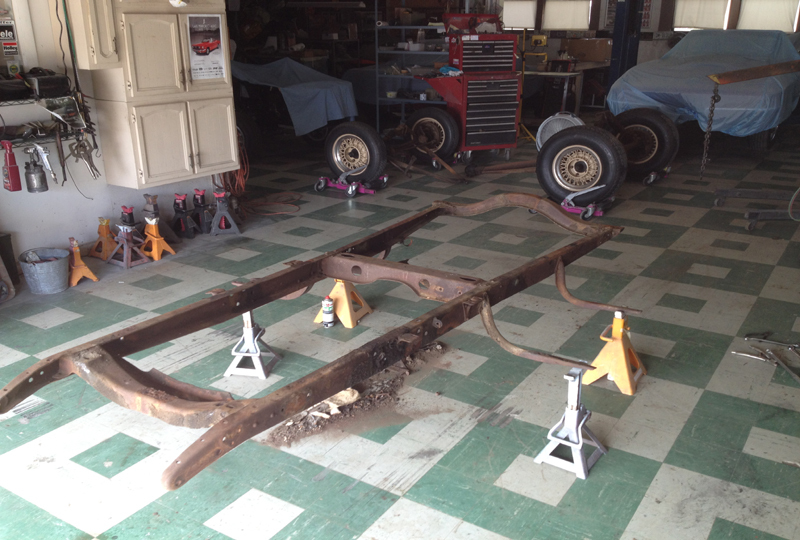 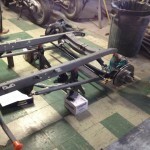 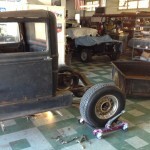 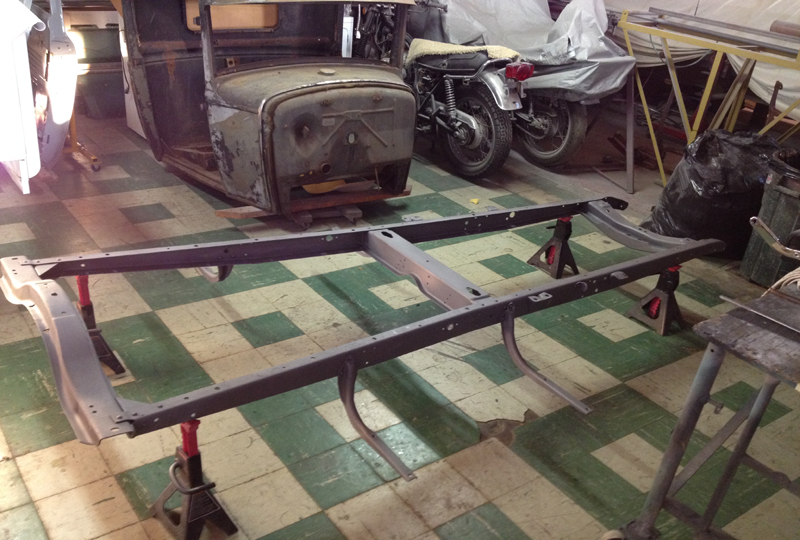 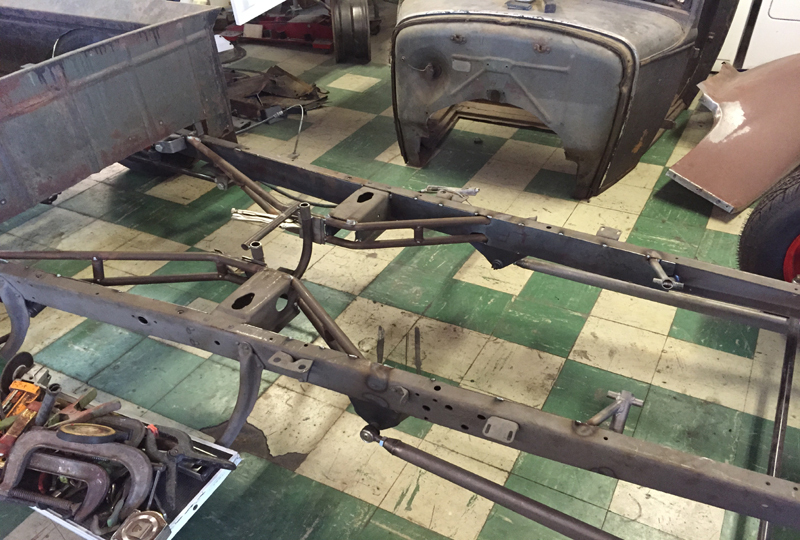 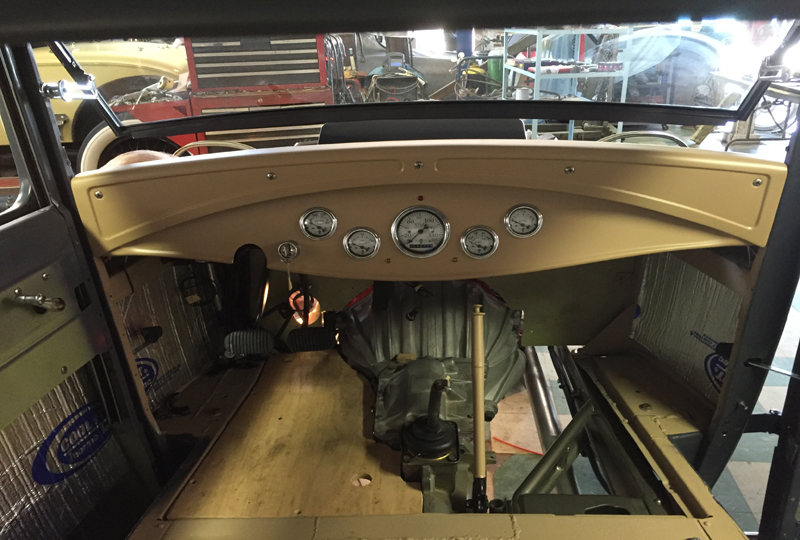 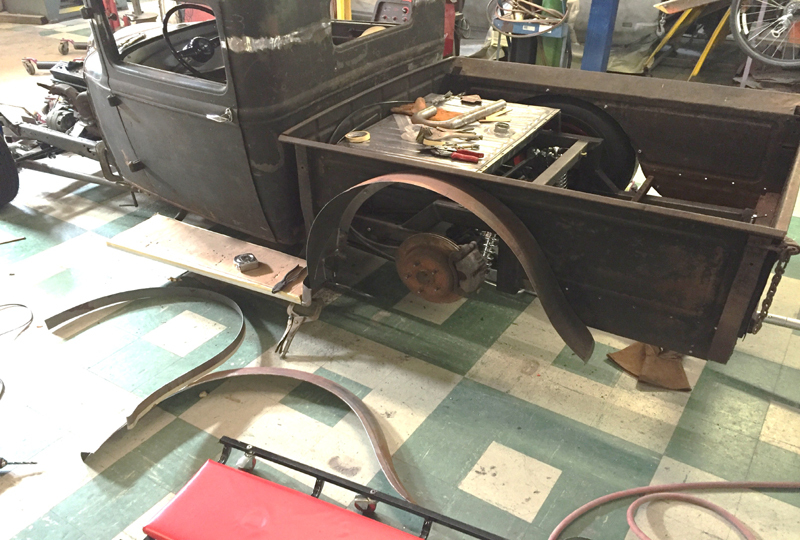 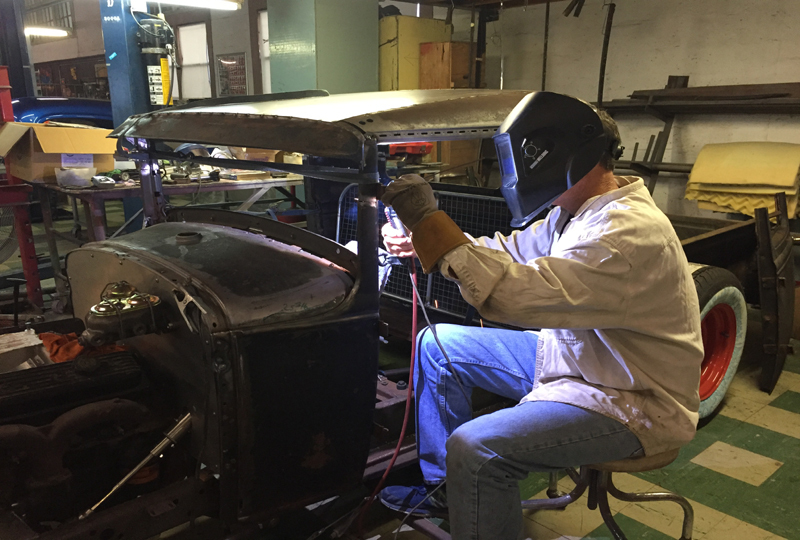 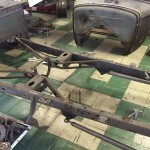 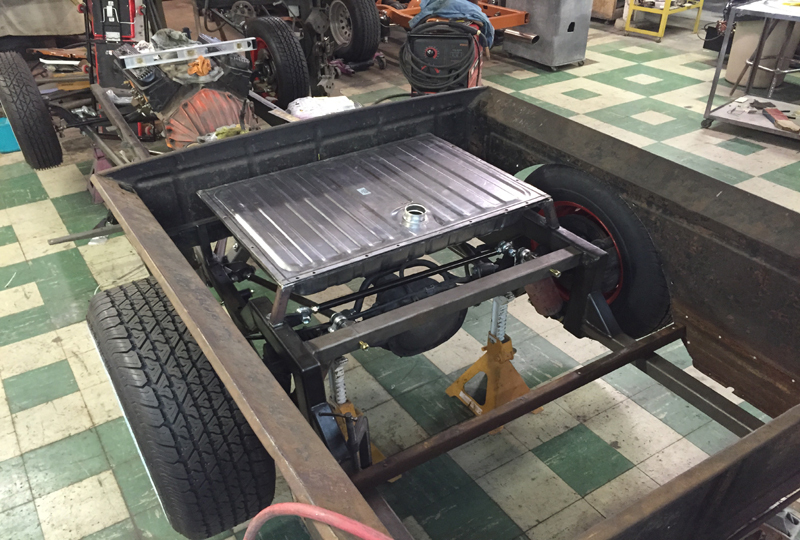 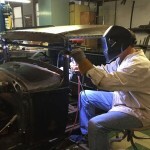 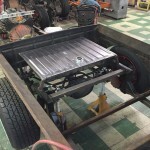 Chassis work is under way and the pre-fitting of firewall, floors and transmission cover. 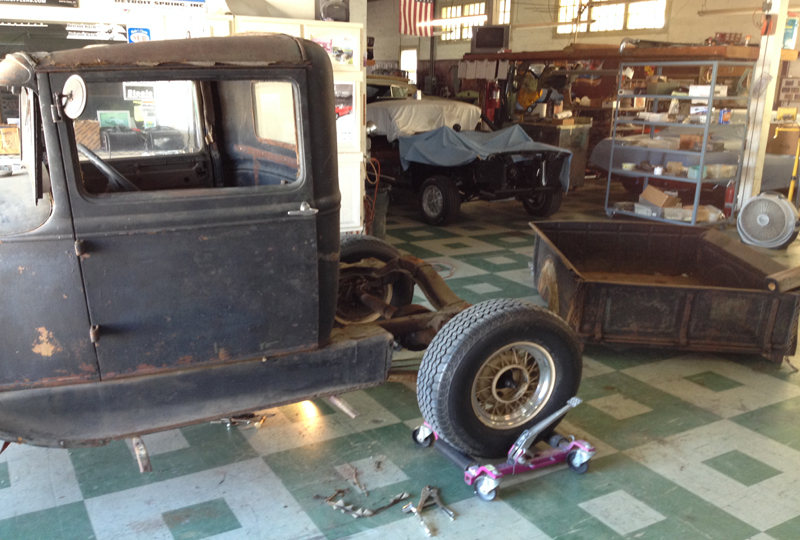 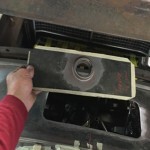 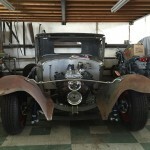 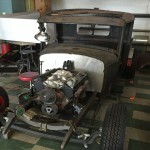 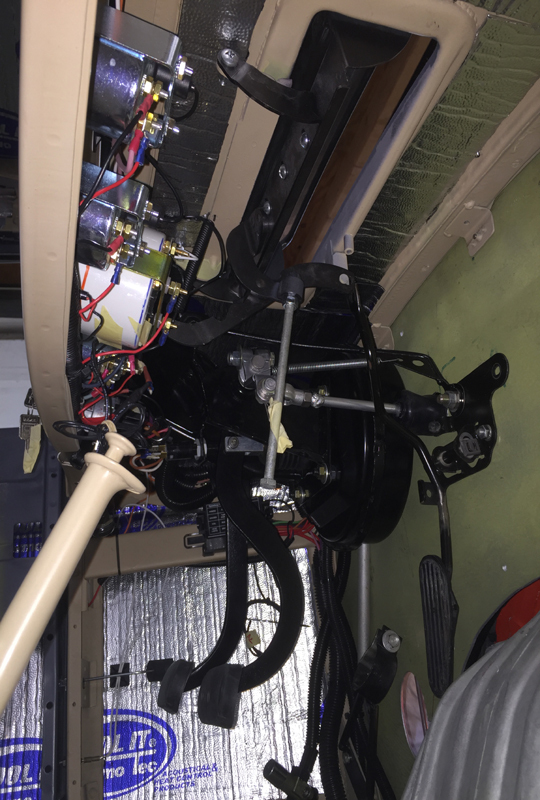 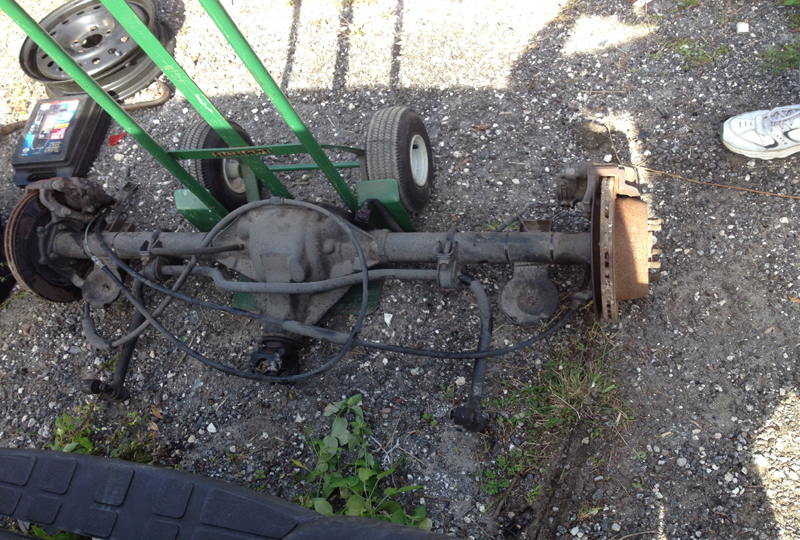 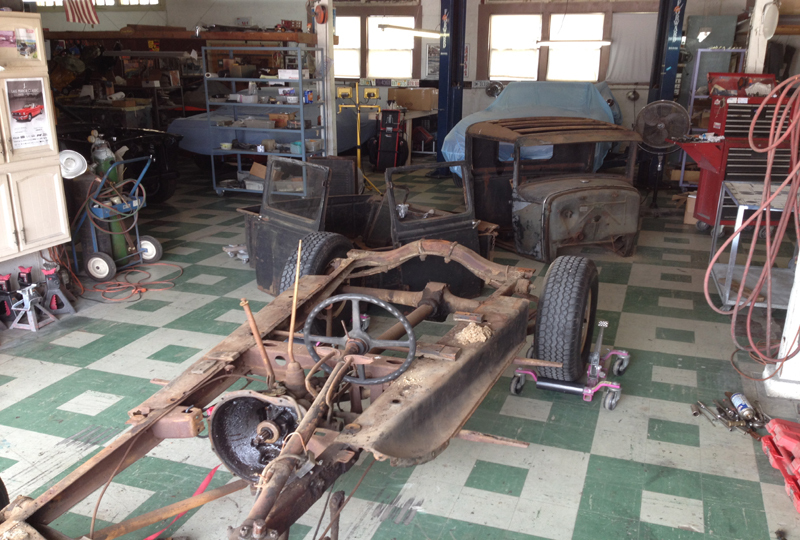 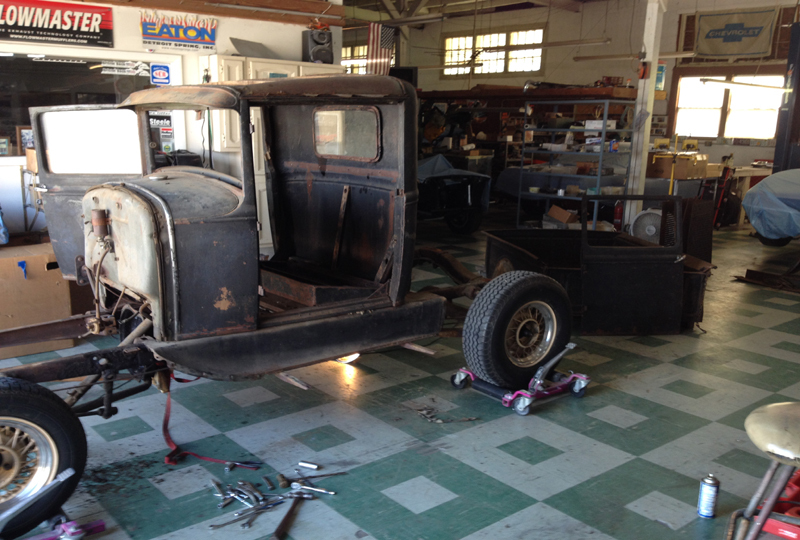 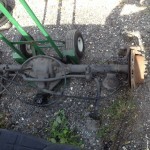 Fuel tank is located, steering box installed and cab is channeled over the frame. 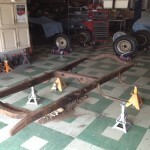 Frame mid section is in and the frame is boxed. 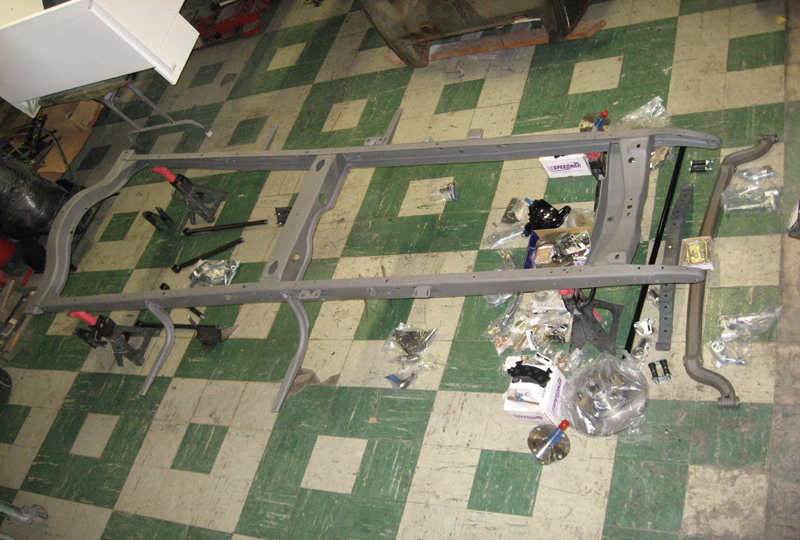 A fixed cross member connects the frame just inside the box to assist in frame strength. 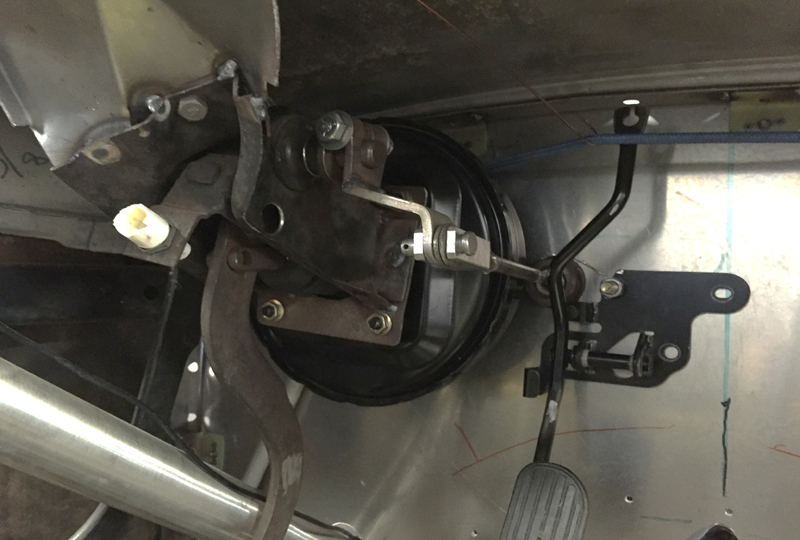 Development and fabrication of the driver controls, clutch, brakes and throttle pedal are completed. 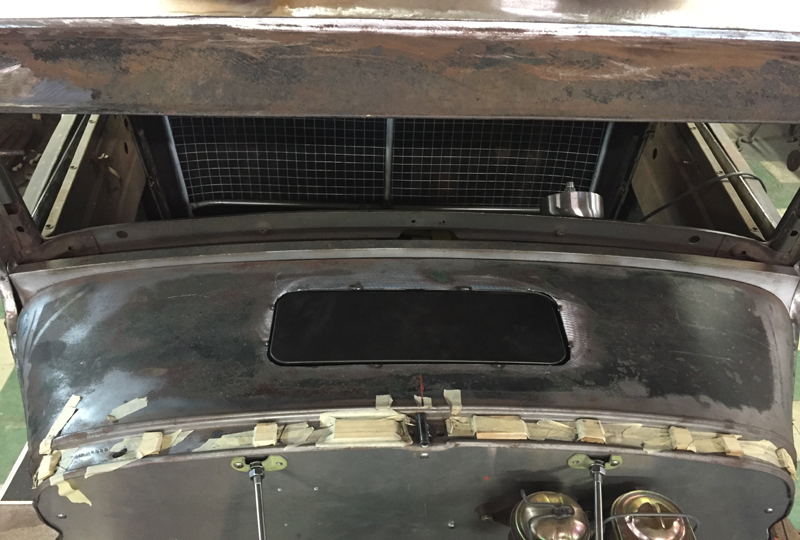 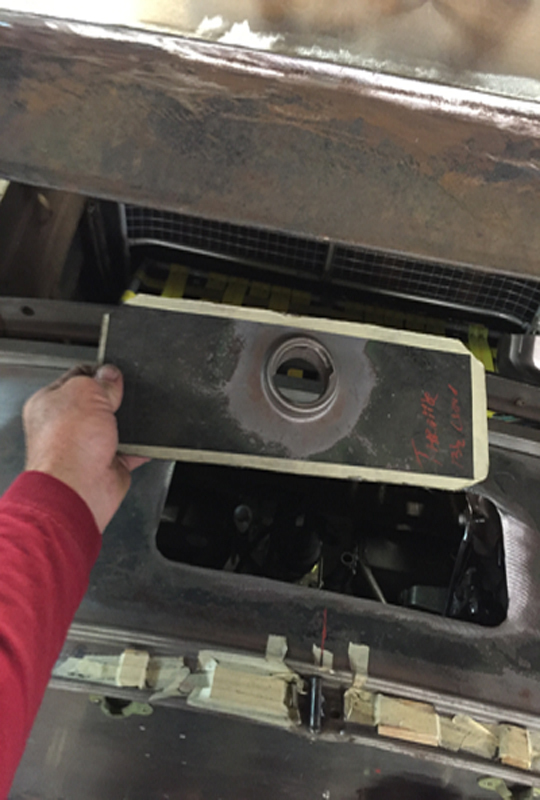 Clutch master and brake master have been located to the attached aluminum fire wall. 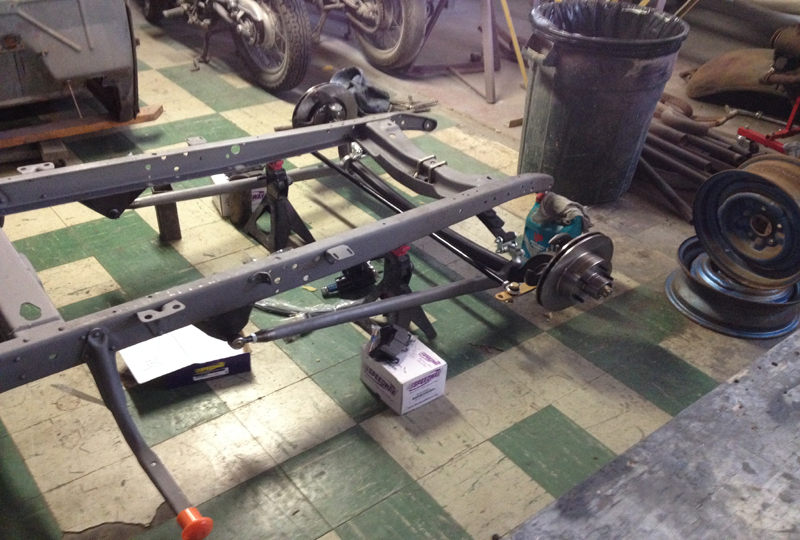 Seat structure design for the best possible fit and ride comfort is also under way and almost completed. 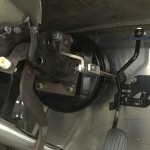 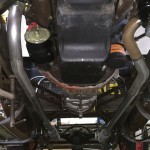 The front shocks upper mounting points are utilizing the modified front fender supports. 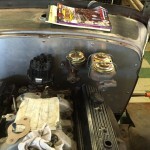 The steering column is located and a single u-joint with splined shaft connects to the Vega style box. 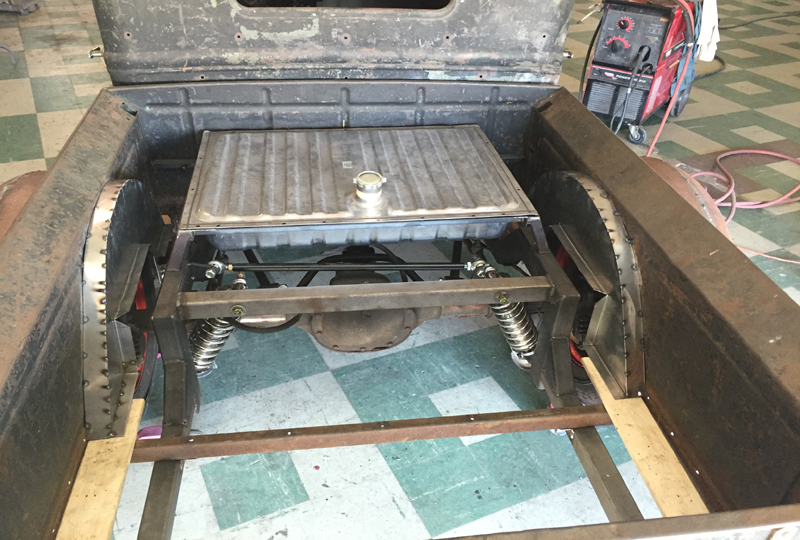 The top has gotten lower by 3 inches and most suspension items are completed and tacked in place. 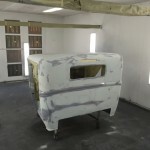 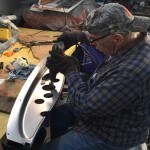 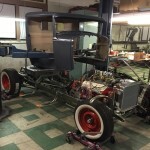 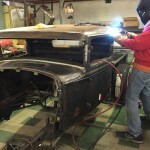 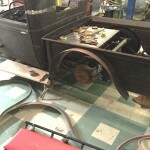 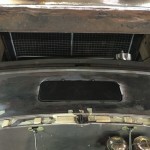 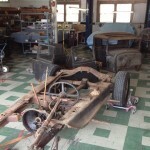 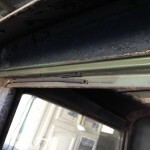 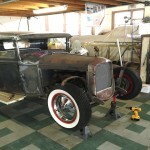 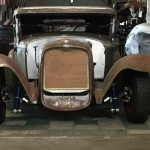 The rear fenders that came with the project were 2 inches wider than original and have been narrowed for a better tire fit and running board connection. 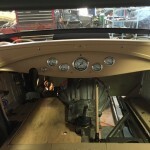 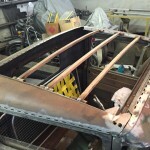 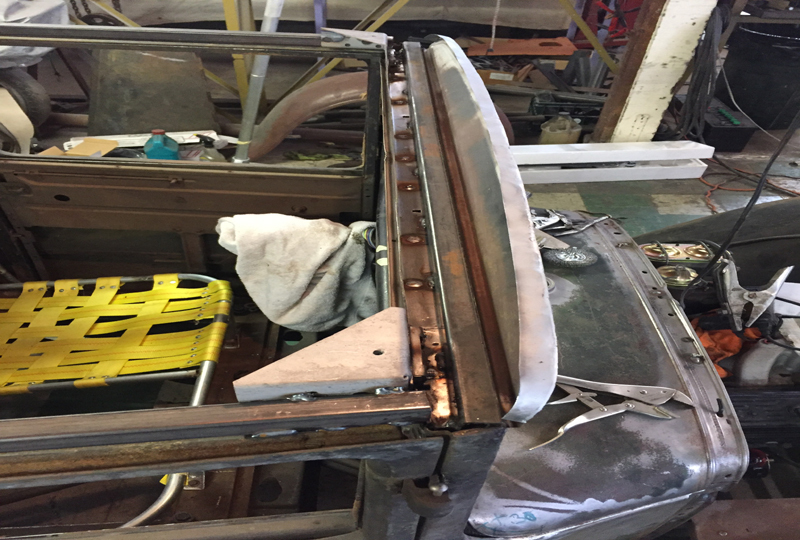 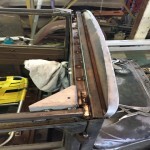 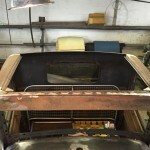 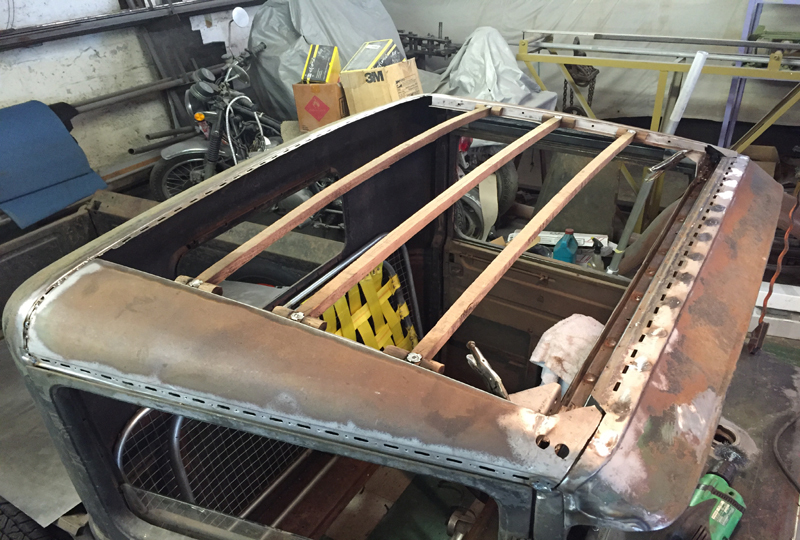 The fabric roof panel has been replaced with a new steel panel to better represent the 32 style. 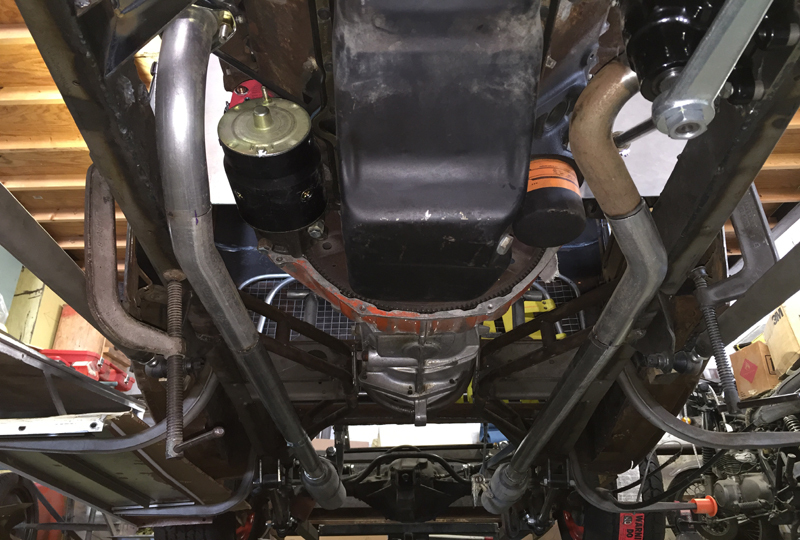 The exhaust has been fitted up to the rear end so far and will go up and over the rear axle to the back soon. 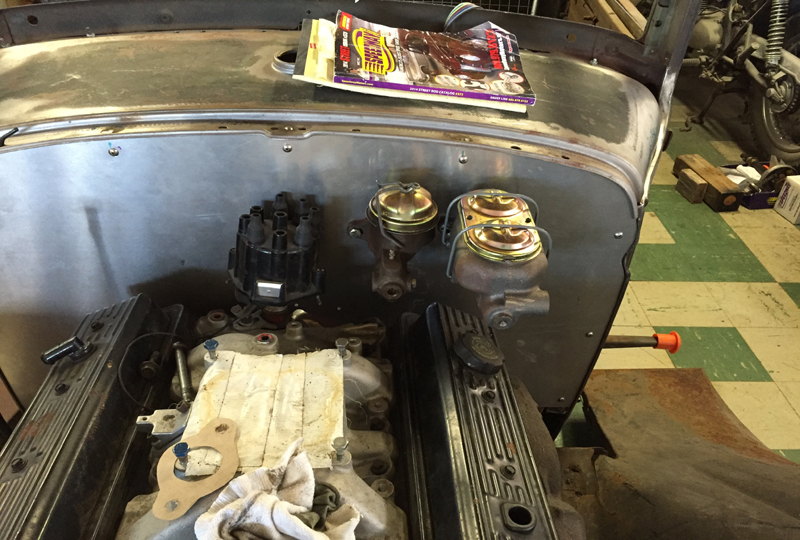 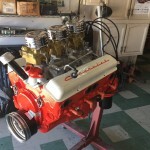 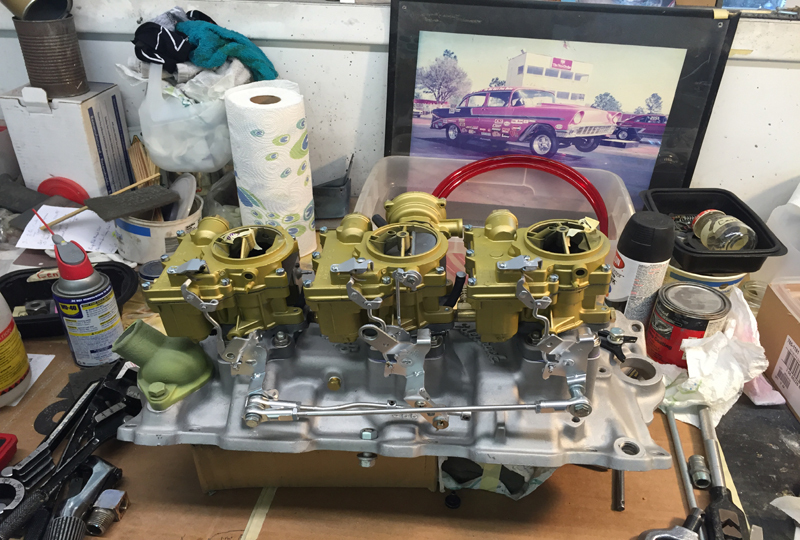 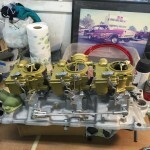 The 3×2 carb system is being completed by dad and should be ready to install soon. 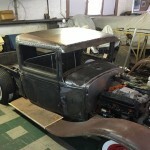 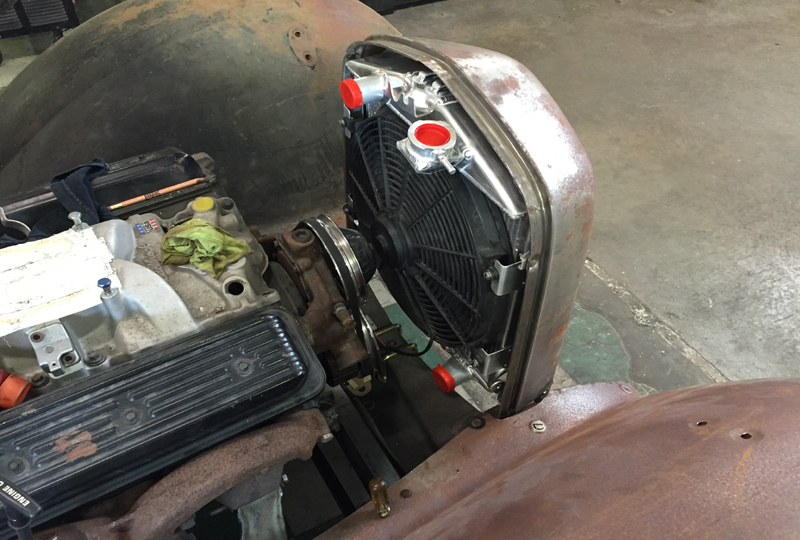 The radiator and shell are under way for best fit and appearance. 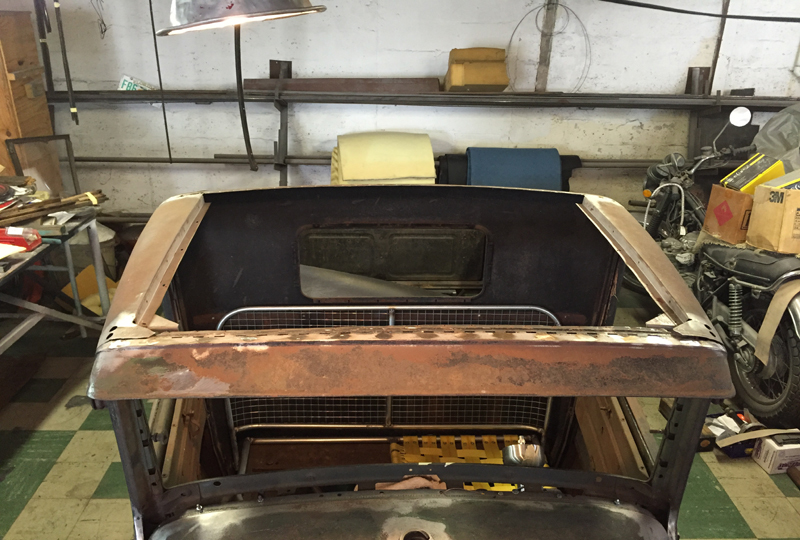 The wood in the top area has been replaced with square tubing and welded together prior to the roof skinning. 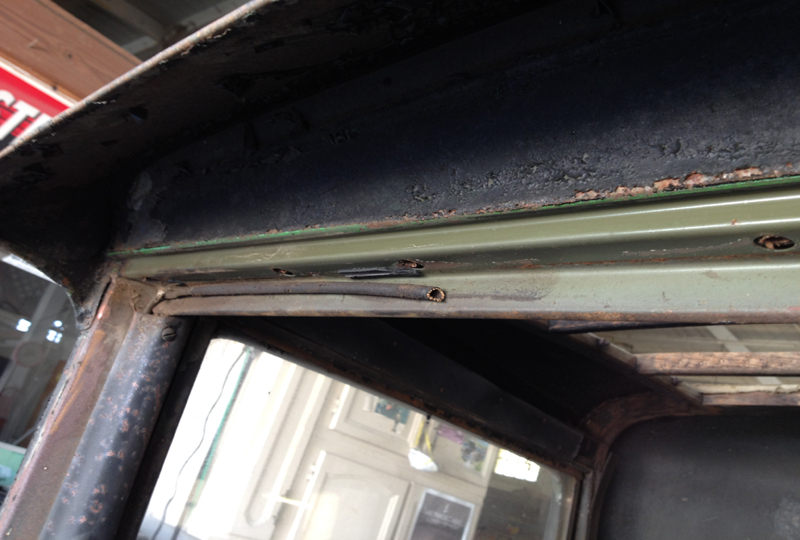 The roof bows were modified to give the new headliner a place to fasten. 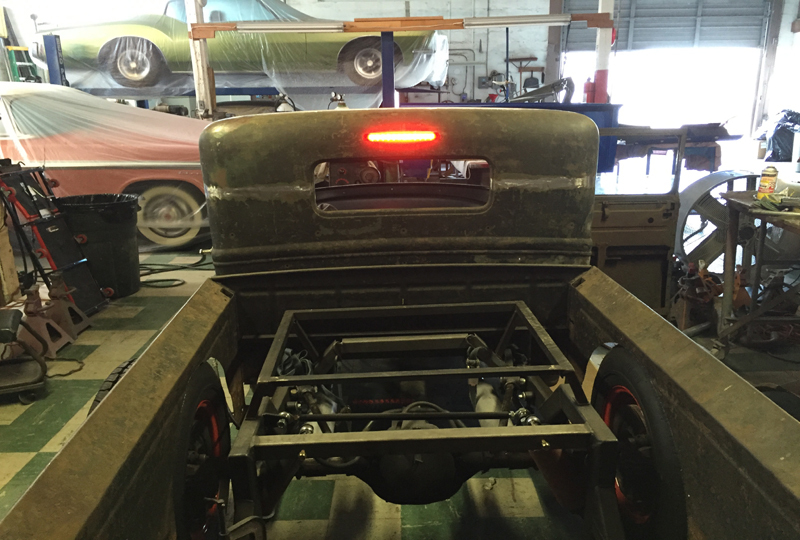 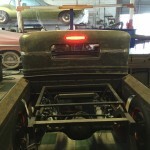 A third tail light has been added for the safety aspect. 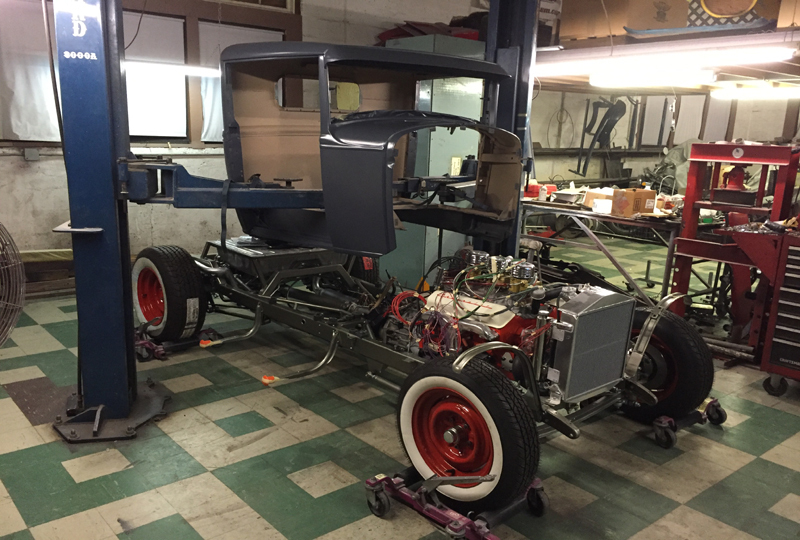 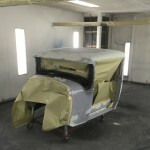 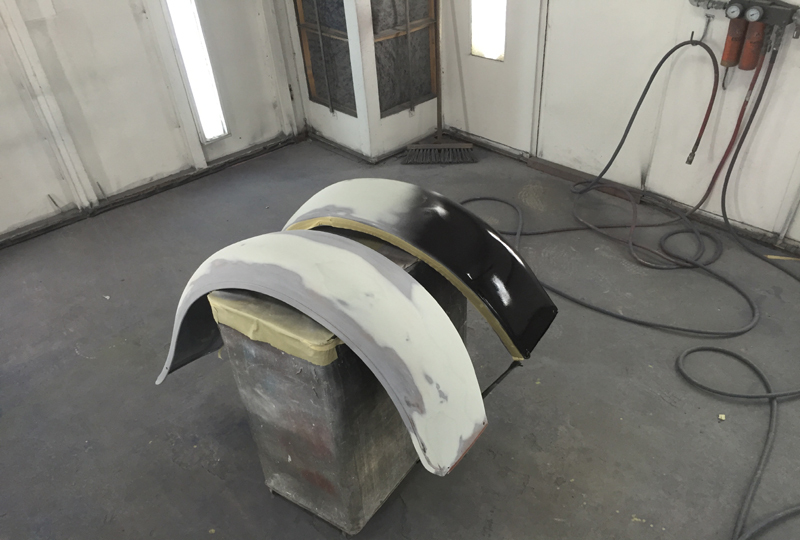 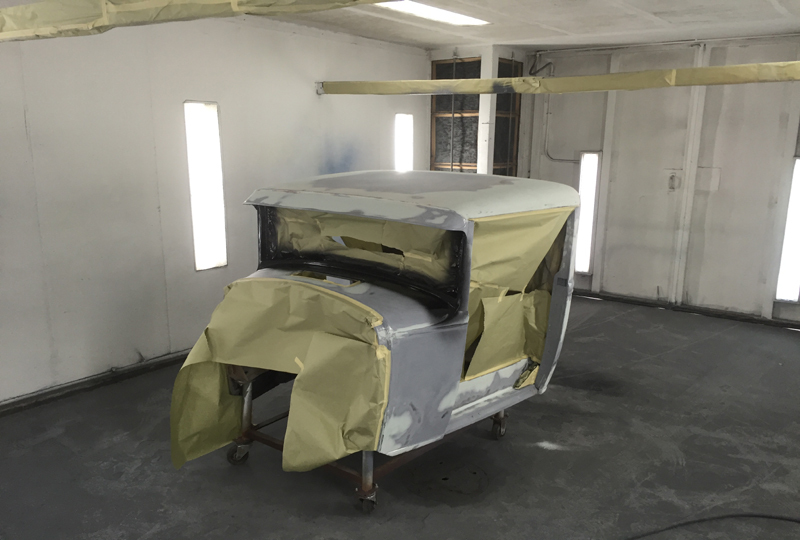 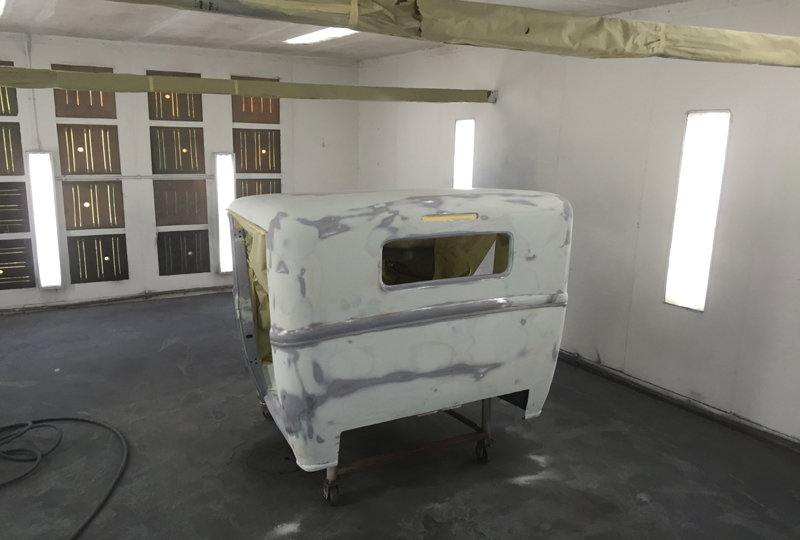 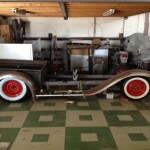 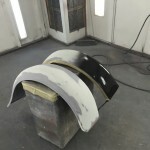 The project has been completely taken apart and all components have been refinished in their final colors. 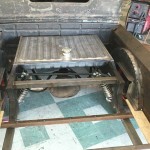 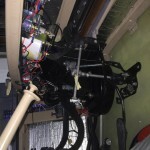 The chassis was completed and engine run prior to the cab drop. 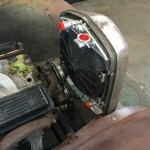 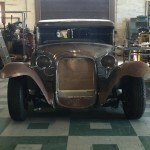 Several 1932 style components have been added to make the 31 look closer to the original. 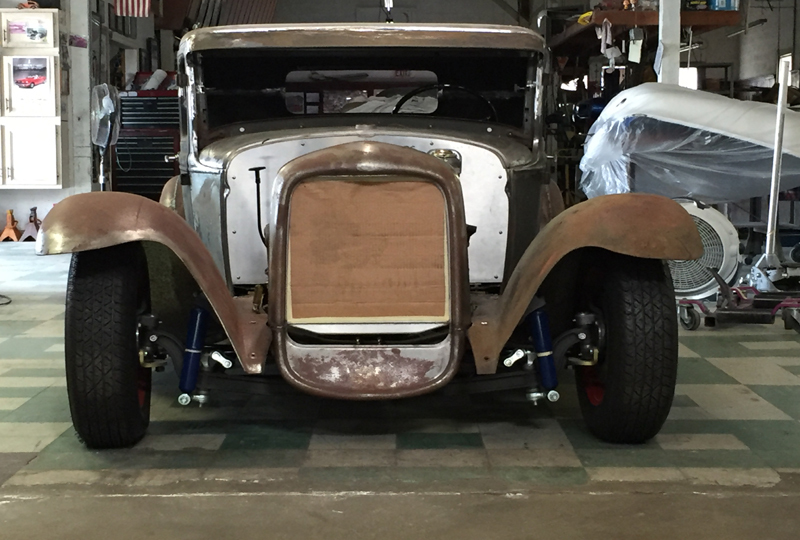 So we’re calling it a 1931.5. 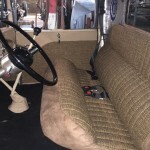 The seat style is very unique to make driving as comfortable as possible for a small cab. 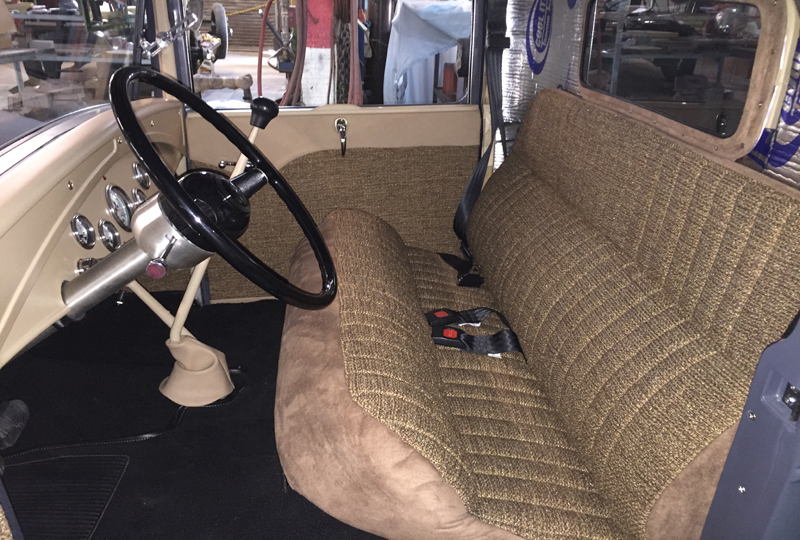 The seat is very comfortable for dad, mom and I. I do have to hunch down a bit to see out the windshield. 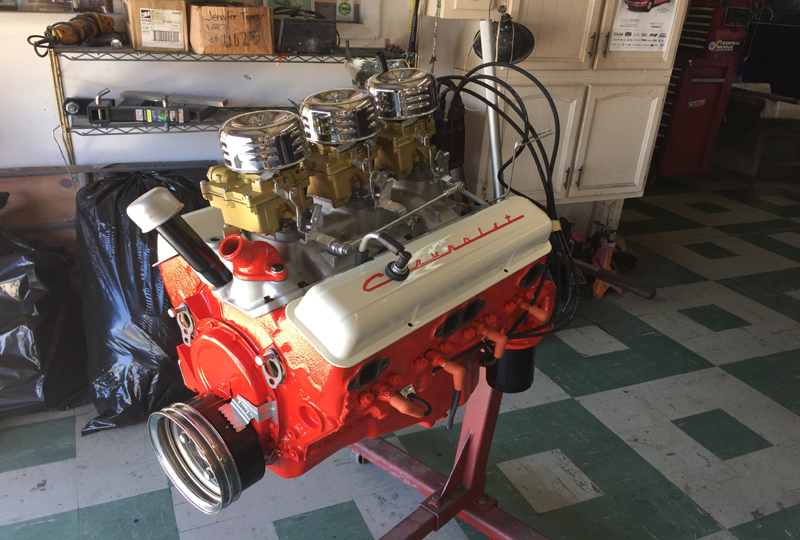 Getting real close to the end! 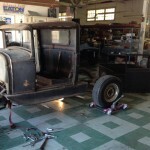 Watch as we recreate and improve what was and now can be again!